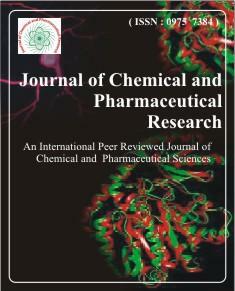 Effect of Cinnamomum cassia essential oil on antioxidative status in Nickel exposed rats during the development period. Subin Mary Zachariah*, Reshmi K. P., Vidya Viswanad, Nithya P. S., Fahina Beegum S. C. and Rajan V. K.
Mudiganti Ram Krishna Rao*, Sanitha Philip, Muttevi Hyagreva Kumar, Saranya Y., Divya D. and Prabhu K.
Mary Jayasheela, M. Purna Chandrakala, Kranti Tekulapally* and Krishnaveni T.
Ibrahim I. A. A. and *Yusuf A. J.
Yousfan A. * and Hasian J.
Vijaya Bhaskar N.*, Ravi Prakash P. and Devanna N.
Gurunadham G.* and Madhusudhan Raju R.
Attih Emmanuel*, Usifoh Cyril O., Orok Edidiong N. and Umoh Ekaete D.
Biosorption study by aquatic macrophyte Lemna gibba Linn. Akmal D.*, Monica R., Asiska P. D., Muslim S., Ben E. S. and Erizal Z.